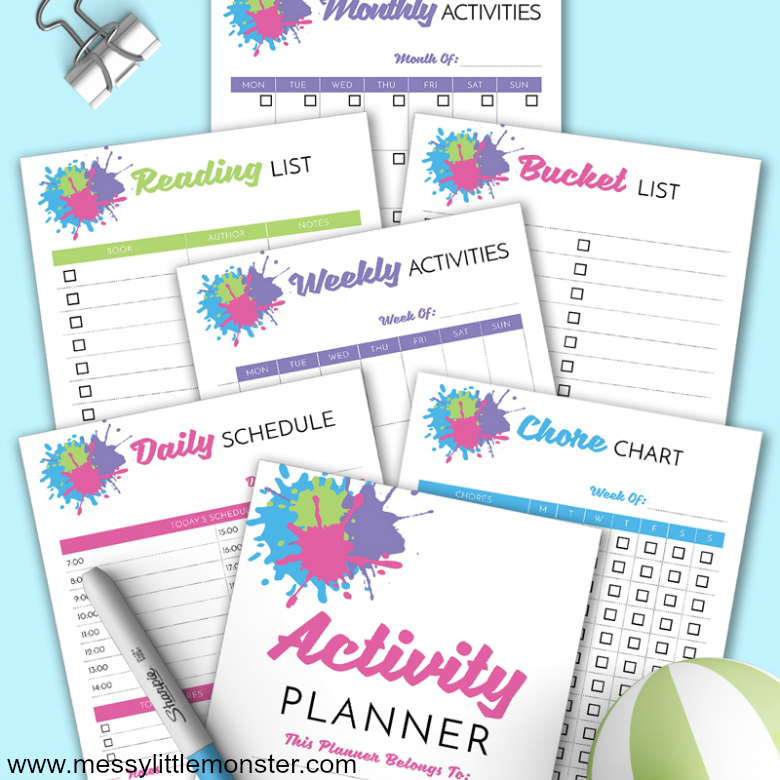 Kids Activity Planner Pack - Get organised with monthly, weekly and daily activity planners! 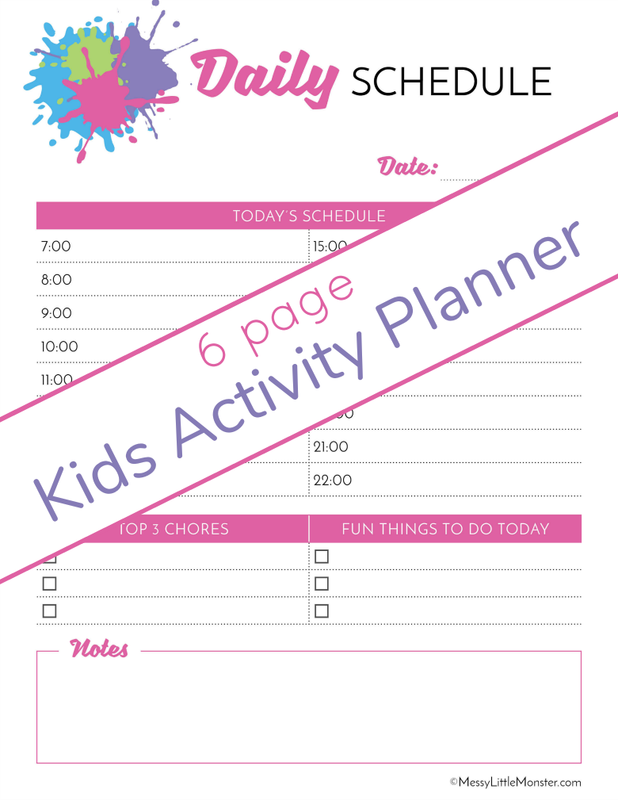 Get organised with our printable kids activity planners. Use our daily activity planner, kids weekly planner or monthly kids activity planner to organise all the kids activities. I think we are all guilty of finding or thinking of fun activity ideas to do with the kids and then totally forgetting (or running out of time) to actually do them! Using a kids activity planner means you have all your activity ideas written down to refer to, you can see everything at a glance and it is easy to check you have a variety of different activities planned! I don't know about you, but for me having activities written on a planner makes me far more likely to actually do them! Scroll down below for your monthly, weekly and daily planning sheets as well as a reading list, bucket list, chore chart and links to some fun activity ideas. There is a lot to be said for being and feeling organised, especially when it comes to kids! These kids activity planners are a great first step to feeling organised and making sure you make time for doing activities with the kids. Whether you plan little activities, things that are quick to set up, trips out or full on projects, the kids will love spending time with you doing all the things they enjoy! 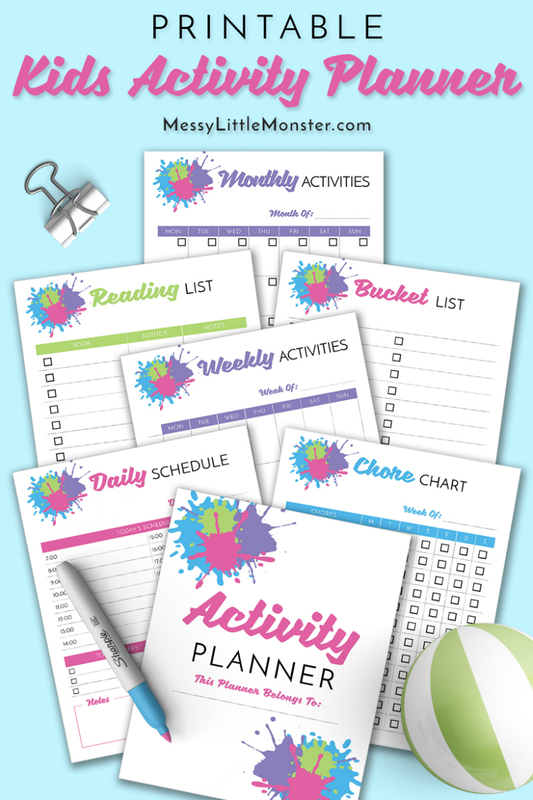 In this kids activity planner pack we have included monthly, weekly and daily planning sheets as well as a reading list, bucket list and chore chart. I personally love the monthly and weekly planners. The monthly planner can be used to fill with ideas, themes or skills you want to work on with your children and then the weekly planner can be used to add a little more detail. The daily planner could also come in handy if you have days where you have lots going on! By planning activities for the kids ahead of time you can make sure you have the supplies needed and can plan to do activities based on different holidays and seasons. We have lots of fun ideas that you might like to try including themed activities in our kids activity calendars. The monthly planner is great to use as an overview. You may choose to plan activities for every day of the month, or just pick one or two days a week where you want to do planned activities. Using the monthly planner you can add in any important events and special holidays so you can plan activities around them. Some ideas may come from your child, while others might be ideas you have seen that you think they will enjoy. The weekly planner could be used to add more details about the activities you have planned or include supplies lists. 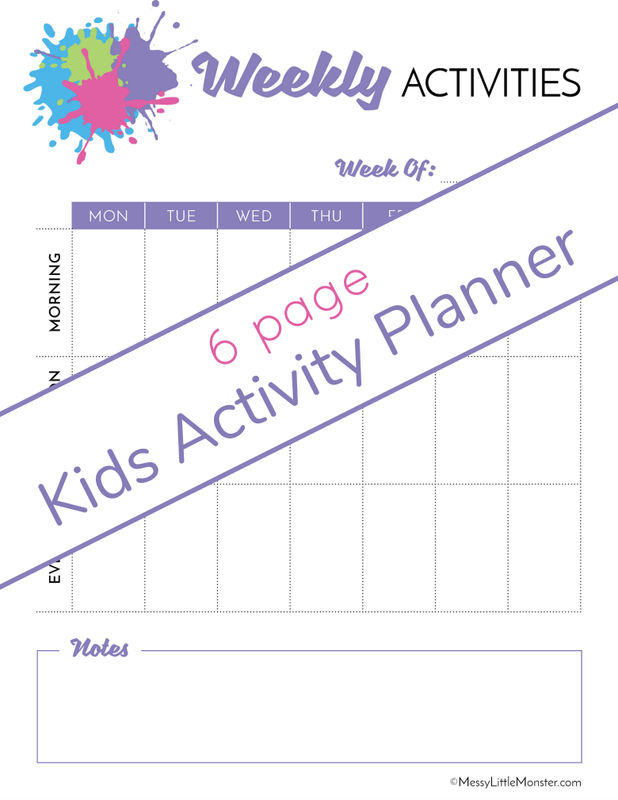 As the weekly activity planner includes boxes for morning, afternoon and evening you could write in classes your children take, planned playdates or anything else planned for the week! I find the weekly activity planner really useful, with three children there seems to be so much going on all the time, so it's great to have it all written down in one place. If you want to be extra organised you may like to use a daily planner. The daily activity planner is great if you like to have your day planned out by the hour. This plan would work really well if you homeschool or have really busy days. Plans are great as a form of motivation, but don't feel like you need to stick to the plan you have made, if your child loves an activity maybe repeat it or do something else similar. Likewise if you start an activity and your child isn't into it see if you can change it up or let them take the lead to turn it into an activity they can have fun with. As well as the monthly, weekly and daily activity planners we have included a reading list, chore chart and bucket list within this kids activity planner pack. I love the idea of having a bucket list to do each season or during the kids school holidays. I love sitting down with the children and asking what they really want to do over a set period of time. Having the children's ideas written down makes us really focus on these activities and it's really fun to be able to tick them off as they are completed. Bucket list activities don't have to be anything big, often simple things like jumping in puddles or making a pile of leaves can be the most fun! The chore chart can come in really handy if you give your kids chores as they can easily tick off the chores that they have done. You could also use this chart for your child to tick off when they have completed everyday activities like making beds, putting dishes in the dishwasher or tidying up toys! We have included a reading list in this kids activity planner pack as reading is soooo important for young children and having a reading list is a great way of children keeping track of the books that they have read. There is a small area for notes so they can write whether they enjoyed each book. 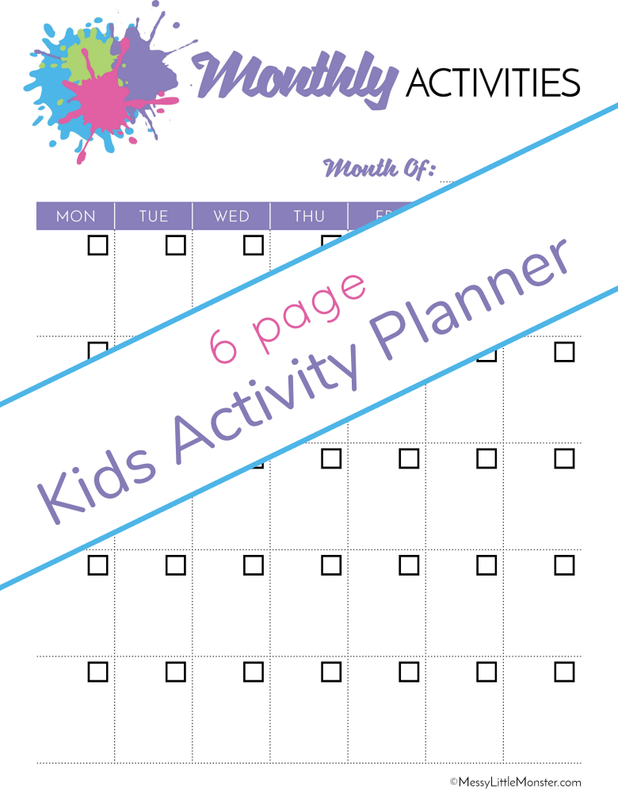 The set of planners included in this kids activity planner pack are all really useful if you want to begin planning and organising kids activities. As I said earlier, for me having activities written on a planner makes me far more likely to actually do them!and for making sure they are actually done! To download this kids activity planner pack there is a small charge of $2. Type $2 in the box and click on 'I want this' below. It may take a moment for the page to load so please be patient. For personal use only. Not for redistribution. All images are copyrighted. Thank you. We hope that you enjoy using this kids activity planner pack to plan lots of fun activities with the kids! Whether you use the monthly kids activity planner, kids weekly planner, the daily activity planner or all three, we hope that these kids activity planners help you to plan lots of fun activities to do with the kids so you can create wonderful memories with your child as you help them learn and develop. Looking for kids activity ideas to get you started? Take a look at our kids activity calendars.